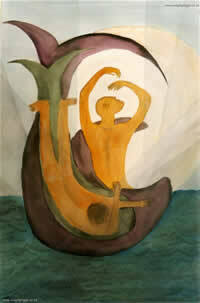 Expressionist and abstract artist Magrit Prigge resides in Pietermaritzburg, KwaZulu-Natal in South Africa. Drawing and painting from an early age, she says, "I have always been aware of the forces separating light and darkness, life and death; the forces of life around me and the cycle of renewal. Which is perhaps why most of my art will give the impression of something new emerging. 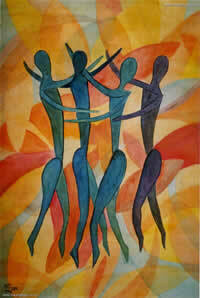 I like to express what I feel and see in vivid colours and symbols." Today Magrit works primarily in watercolour, with additional work in acrylic and charcoal. Her favourite artist is Marc Chagall. Magrit's artwork can be found in private collections around the world, including in Germany, Canada, Ireland and Africa. "That people will experience my art as an expression of the Christ presence from within, and that my art may open the eyes of my fellow men to the understanding of a life of fullness and freedom in obedience." "To picture the new life in Christ in colour, composition, soul expression, spirituality - be it abstract or realistic." 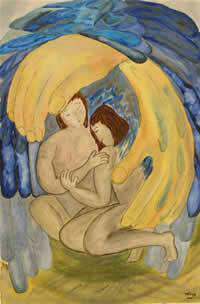 Magrit adds: "The scriptures that accompany my artworks served as inspiration. However, I would like the audience to feel free to make their own interpretations."